PanARMENIAN.Net - The Fresno City Council is honoring the life of Fresno born playwright and author William Saroyan. 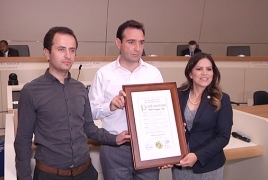 The City Council issued a proclamation declaring Friday August 31, 2018 as William Saroyan Day in the City of Fresno. The honor comes as the Fresno home where Saroyan spent the final 17 years of his life is about to open as a museum. The foundation based in Armenia that bought the home in 2016 says at one point city officials wanted to move the house to downtown Fresno. But they say it was important to keep it in the neighborhood where Saroyan lived and breathed. "William Saroyan has walked there, he has ridden his bicycle there, he has lived there, he has communicated with his neighbors there, he has written some of his works there. So, I feel this energy when I'm there," says Hakob Hakobyan of the Intellectual Renaissance Foundation. The grand opening and ribbon cutting at the William Saroyan House Museum is Friday, August 31. which will be followed with a public celebration at the Satellite Student Union at Fresno State.